In this day and age people want their own home oasis, a place to get from it all and reconnect with family and friends. Decorative concrete allows one to have beautiful surfaces outside just like a resort. Concrete is less expensive, in most cases, than stone, marble, or pavers, so it makes these beautiful surfaces more possible from a financial point of view. Concrete surfaces outdoors are unlike any other type of surfaces. An endless variety of looks are available with decorative concrete. Those wonderful expensive looks that you have always wanted-stone, slate, tile, are all available in concrete. The wide array of patterns and colors available make it possible to substitute concrete for almost any hardscaping material, from flat to vertical finishes, at a fraction of the cost. Brick, slate, flagstone, stone, tile, and even wood can be precisely mimicked in concrete. Is it any wonder that it is growing in popularity? Stamped concrete is the most popular form of decorative concrete today because it comes in a huge array of styles and colors to suit any homeowner’s tastes. Concrete is stamped while it is still fresh, using a rubber tool that creates a pattern on the surface. Once the patterned concrete is dry, a sealant is applied to protect the surface. Stamped concrete can assume the look of brick, flagstone, or a host of other surfaces, but with much less maintenance involved. Stenciled concrete follows the same principle as stamped concrete, in that the surface is worked over while the concrete is still fresh. However, stenciled concrete uses paper stencils instead of the special tools used for stamping. The paper stencils are placed over the surface of the concrete, and then a color hardener is used on the exposed surfaces to create the illusion of bricks or stones. The covered areas end up looking like very realistic joints between the bricks or the stones. Stencils also come in a wide range of styles, and combined with the many colors available, give you a truly personalized look to your project. Vertical concrete is another facet of decorative concrete that is only limited by your imagination. With vertical concrete we are able to create or replicate any type of look on any vertical surface. The more common finishes include any type of rock or stone pattern, brick or block patterns, dry stacked stones, flagstones, weathered wood planks and any of the plaster like finishes. The more exotic patterns include tree bark, hammered metal, geometric patterns, and even bamboo shoots. Vertical concrete is applied to any surface, stamped to any texture, and carved to create even more detail. It is then colored and highlighted by various methods to create the level of detail that is needed to give you the look of stone work. Vertical concrete can be used to create one of a kind fireplaces, columns, planters, gateposts, and just about anything you can imagine, indoors or outside. Color can be added to the concrete in several ways. There is integral color which is mixed into the concrete before is poured. Another option is to use color hardeners, which are scattered over the top of the wet concrete and worked into the slab. Finally, there are stains and dyes. Acid stains give concrete a mottled, variegated, marble-like look. Never expect acid stains to be uniform or have an even tone, you will get different reactions from slab to slab, and even on the same job you may see different coloration patterns. Variations of colors and mottling are to be expected and enjoyed. It is this random mix of tones and shades that give an acid stained floor it’s unique beauty. Things to consider for your outdoor “oasis” Planters, retaining walls, water features, fire features, bistro patio, outdoor kitchen, conversation pits, fireplaces, pizza ovens, quiet space for contemplation, dining room, sport courts, seat walls, built in tables, bridges, lighting, destination gardens, patio covers and pergolas. 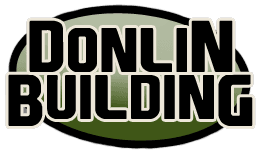 If your next home improvement project includes concrete, then it should include decorative concrete by Donlin Building, Inc. Whether you are looking to replace an old patio or porch, build something new, or add to your existing landscaping, decorative concrete may be the visual enhancement that will make the difference. With a Decorative Concrete project, "getting away from it all" can be as easy as walking out your back door and into your own personal oasis!